Why should you move to Ao Nang? Well, Ao Nang is a pretty outstanding place to live, especially if you’re a digital nomad, retiree, or expat! It has absolutely spellbinding paradise panoramas. It has a vibrant vacation/holiday culture, while still maintaining some untouched uniqueness. Exotic new experiences abound, and familiar expat comforts are close at hand. Fast wifi is in abundance, and picturesque beach-scapes are plentiful — often overlapping. Ao Nang (aka. Aonang) is a gem. If you’re looking for a place to move in Southeast Asia, Ao Nang is an excellent place to start. 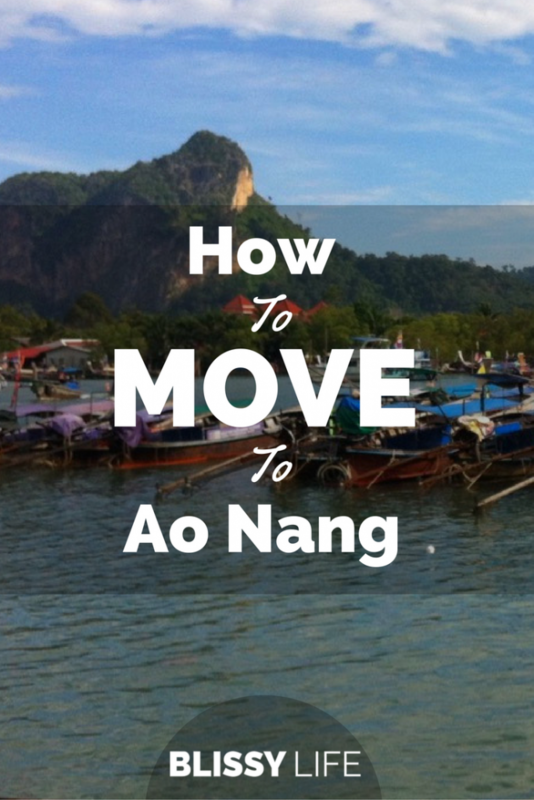 Here are some tips on how to move to Ao Nang. We were really happy to find a nice deal at a place called Pavilion Queen’s Bay Hotel in September before high season drove prices up. We had a gorgeous suite to ourselves for a low daily rate, and we loved the stability while we scouted around. Booking.com Click here to get $20 off your next booking! First things first-ish. On Thai roads: expect the unexpected! Though the rough idea is to drive on the left side of the road in Thailand, there is a lot of creativity. Here are some quick tips to get you in the right frame of mind. Embrace surprise. This may be a new culture to you. The norms may not seem so normal. Don’t judge it or begrudge it. Learn and adapt. Expect scooters to literally drive on the wrong side of the road — but expect it on the curb. This is one of the most shocking traffic norms. If it’s convenient, people will drive along the curb in the wrong direction. If you play it safe by staying near the curb, don’t hug it blindly. Scooters and motorbikes abound. They move in fluid patterns. Go with the flow. Expect slow and aimless “drifters”. These cars glide along at walking pace, and can seriously mess with your expectations. They will glide slowly for quite a while, so make your way around. Seriously, though: don’t worry. 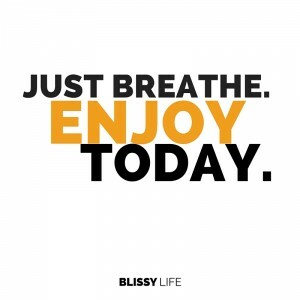 You may notice that nobody is remotely stressed. Surreal things will happen. Let them occur, adapt, and continue. Relax and enjoy! For the most part, it is lazy holiday drivin’! Ask about neighborhoods, discover your personal attractions, and find those places you’d like to frequent in your day-to-day bustle. For digital nomads: find those great wi-fi hangout spots! It’s really easy to get a Thai phone number. Just buy a SIM card at any phone shop, pop it in, and voilà! You’ve got a Thai phone number. Also, very importantly: you’ve got a data plan (probably 3G or 4G). Here’s a great guide on managing your Thai phone account (in English). 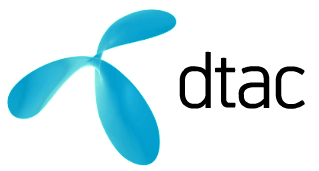 We’ve been pretty happy with DTAC. Though maybe that’s because their plans use terms like “happy” and “smile”. You can recharge your SIM card in convenience stores like 7-Eleven and Family Mart. There are ATMs all over the place! It feels like there is one ever five feet… which is fortunate because few places accept cards. Most major banks in Thailand have a branch on 4203 heading away from the beach towards Krabi Town. We highly suggest avoid going to the bank during lunch time or right after work, because you will wait in crazy long lines. Try going during an awkward time. Honestly we had an issue sending and reviving mail from the US — but we still did it because it’s fun. Buy stamps at the post office near Tesco Lotus and drop your post off in any red box. Though it would be nice to book everything online, sight unseen — it truly is best to find things in person, once you’re here. But don’t despair! We give tips on how to establish a toe-hold while you scout around… and you’ll be much happier this way in the long run. Property In Krabi — Pear is a sweetheart, and super helpful. She helped us to find our place. Pay your utility bills at 7-Eleven. Don’t loose the original bill you are given/mailed, because there is a bar code that the 7-Eleven cashier scans. If there is no bar code, they can’t really help you and you’ll need to go to the main office to pay. Bear in mind that rainy season will impact your lifestyle. If you’re looking to hunker down with a cup of tea for your writing sabbatical, this weather may be your (other) cup of tea. It’s not all-encompassing, but it does impact almost every day. Make your call and navigate it well. Remember to encase your phone/gizmos in plastic while traveling. Since prices are pretty great compared to the US and lots of Western places, and since Thai food is pretty delicious, we’ll showcase some favorites. Remember: ask for “not spicy” if that’s your taste, and mention “no rice” if you aren’t going to eat it. Cuckoo’s Nest — A fave. Sweetheart visionary Noise and her team are just awesome. The food is fresh and delicious at a fine price, and much of it comes from her hand-grown garden. Great for lounging, dining, drinking and meeting up. Khow Soy Restaurant — Really inspired cuisine, and don’t let the unassuming location fool you! The atmosphere is imaginative and pleasant. Most importantly, the chef has a lovable passion and it shows. Looks great for drinks too. Carnivore — Pretty outstanding steaks and hearty meals, along with an exception selection of Belgian beers and nice wines. Jenna’s Fine Bistro & Wine — Stellar food, fun coktails. Especially nice for brunch. Diver’s Inn — More soon. Go for it. Be cool and tip as you can: 10-20%. Basic street smarts are enough: don’t leave valuables unattended, and don’t open yourself to scams: establish clear prices and agreements in advance. You should be fine. We found that Wanalee was pretty awesome. Establish a long-term arrangement and you may find a scooter as low as $5/day. Highlights coming soon: Post Office, Police, Hospital, Public Services, etc. Don’t overlook the local markets! Night Markets — Less about raw produce and more about prepared meals… as well as clothes, toys, housewares, etc. These have a festive hangout feel, kinda like a town fair. Mini-Marts — Often family-owned storefronts for your essentials, these often offer a convenient location for your essentials and basic foodstuffs. Supermarket — There’s pretty much just Tesco Lotus on the east side of town. The meat is out in an unwrapped buffet layout, but seemed just fine. Alcohol is not sold in the afternoon: roughly 1pm to 4pm, I believe. Big C — Actually in Krabi Town, this is the main big box store that serves well for housewares and essentials. They also have a large grocery section. Home Pro — Also in Krabi Town. This is a great place to buy housewares. It’s a bit more expensive than Big C, but also more fashionable. Center Point is the a lively part in the touristy part of town. Blue Dragon Cabaret is a pretty fun show, and there are clubs with bargirls or just a dance/hangout vibe. There’s a small red light street a little way up the main street in a section called RCA. On the quieter west side, Luna Bar offers some nice dance club vibe. Hippies Bar is one of our favorites! It’s along the ocean, has good food, live music, fire spinning shows and great owners! An undiscovered area just a bit to the west is Long Beach. It feels really remote and relaxing! Also, you are able to easily catch a ferry to Ao Nang to a handful of paradise islands. One of the best ways to connect with people is to join the Facebook groups. These are also a great way to buy and sell items. Here are some groups! Have any suggestions on making this page more helpful? Have any questions that we could answer here? Hey Bryan! We are so excited for you! Ao Nang will always hold a special place in our hearts. We are currently in Chiang Mai, and it’s just not the same… of course. There’s nothing like having the beach a hop and a skip away. We wish you luck and keep in touch! Hi, my name is CARMEN and I like to know all about the retirements in Thailand. I like to retire in 3-4 years. I am German living since 20 years in Florida. Want to live close to the beach, with diving, relaxing, but also want to go on mission trips. Do you think Ao Nang is a good place? I will only have maybe up to $1500 for rent and living available. Oh, did I mention, that I am 60 years young…. Hi Carmen, welcome to Blissy Life! Ao Nang is a fantastic little town and one we often think about returning to! We highly suggest you check out a couple of Thailand beach communities before you choose one. Ao Nang is small and has easy access to Krabi Town and international Airport, and we were pleasantly surprised by how easy it was to explore nearby islands. Please feel free to ask any questions you may have, we love Ao Nang! Hi Jenny, that’s so exciting! I think you and your family with love Ao Nang… of course, the best way to find out if it’s truly a good fit is to visit for yourself. Although from everything you say, I think you will enjoy the community. It’s a bit touristy by the beach, although it’s easy to find a more “local” side of the town and expats that have been there for years. We also loved how easily you’re able to visit the many islands off the coast. You may also want to check out Chiang Mai, although you obviously won’t have the beach nearby. Please feel free to ask us any questions you may have!